A labral tear involves a tear of the cartilage rim on the edge of the hip socket. Labral tears can occur with sports, a specific injury or incident, or may develop over time. Some underlying causes of labral tears include hip impingement, instability, and internal snapping hip. When the labrum tears, the hip's suction seal is disrupted and the joint loses its lubrication and stability. This can compromise the articular cartilage and can lead to arthritis, possibly progressing to the need for hip replacement even in young patients. A torn labrum can cause a patient to experience deep, sharp pain in the groin area. Pain may radiate into the thigh or down the leg, and may be dull or sharp. Clicking, catching, locking stiffness, feelings of instability, weakness and decreased athletic performance are also symptoms of a labral tear. When surgery is needed, arthroscopic repair of the labrum can effectively treat pain, and may restore the lubrication, function and stability of the hip joint. Labral repair is performed using small anchors with sutures attached. The anchors are placed into the bone, and the sutures are used to sew the labrum back to the acetabulum. This highly technical procedure allows sufficient restoration of the hip's native anatomy essential to recreating the hips suction seal. Labral repair techniques, which have been developed at the American Hip Institute, are focused on restoration of the native anatomy and function of the labrum. 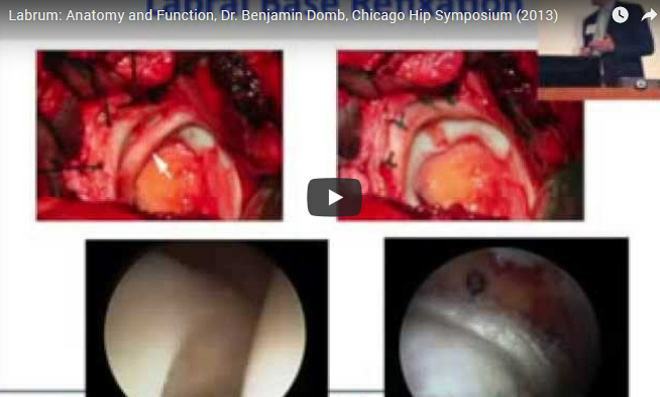 Dr. Domb continues to research the most innovative and optimal techniques for hip arthroscopy and labral repair. In rare cases, when the labrum is found irreparable, it can be reconstructed. Similar to an ACL reconstruction, the hamstring tendon is used from the same sided knee. Anchors are used to secure the labral graft to restore the function of the native hip joint. 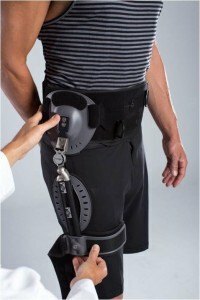 Hip arthroscopy is generally an outpatient procedure, with fairly minimal pain. The average postoperative course involves 2 weeks in a hip brace and 2 weeks on crutches to protect the work done on the hip. A brace may be required for 6 weeks, and crutches may be required for up to 8 weeks if the hip's condition requires a more extensive surgery. Most patients begin riding a stationary bicycle and begin physical therapy the day after surgery. Patients can return to work as soon as a 2-3 days after their procedure, depending on their work type. Athletes can expect to return to sports between 3-6 months after surgery. High-level athletes participate in an intense physical therapy course after surgery, gradually increasing their workout intensity.